1. Plugin your USB flash drive and move your mouse to the bottom of the screen. Locate and click on the Playback button selected in blue below. 2. Once in the playback menu, select the channel with the video that you want to backup. In the image below channel 01 is selected. 3. Select the date of the video. 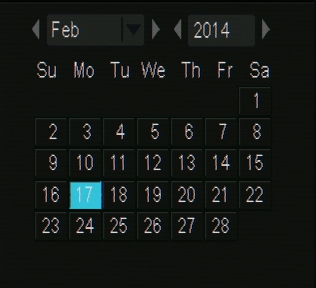 In the image below February 17th is selected. 4. Select the 6 hour block that the video is in and click Search. Left-click on any video files you wish to backup. 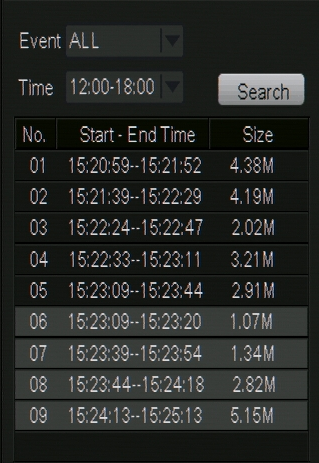 In the image below 12:00-18:00 is selected and the bottom four video files are selected for backup. 5. Once the video files are selected click backup. This will start the backup process. Wait until the Performing backup status bar shows 100% and stays there as shown below. 6. Your backup is complete. You can exit the menus and remove your USB flash drive. These files are already in the .MP4 format for easy playback on multiple devices.